Like many kids, German-Moroccan paleontologist Nizar Ibrahim nursed a fascination for dinosaurs from a young age. The difference is, he grew up and actually found one. Ibrahim vividly remembers learning about Spinosaurus, a massive aquatic dinosaur whose only known bones were destroyed during World War II. As a kid, Ibrahim dreamed of finding new fossils of this giant — and in his mid-20s, he succeeded. (TED Talk: “How we unearthed the spinosaurus.”) Below, he explains how sheer determination and a bit of magic led to his current achievements as a paleontologist. Can you actually say, “I have discovered a dinosaur”? I can. 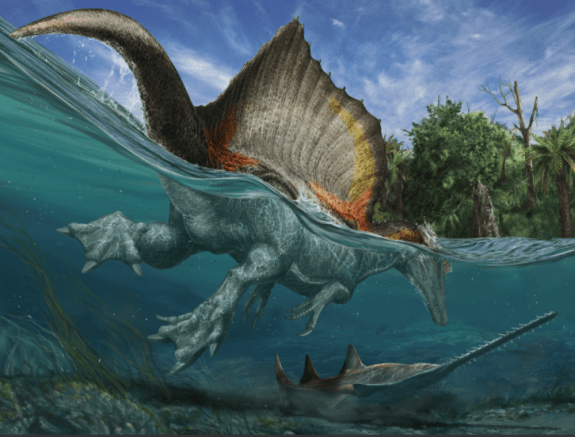 I led the team that re-discovered Spinosaurus, a 50-foot-long carnivore who hunted its prey in rivers 97 million years ago. I also discovered a big flying reptile with a 20-foot wingspan — the largest flying creature that lived in Africa, that we know of. We call it Alanqa saharica. “Alanqa” is an Arabic/Persian name for the phoenix. You know how the phoenix dies and then rises from the ashes? 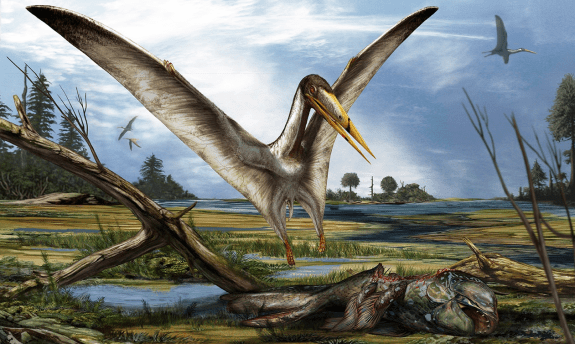 Well, our flying reptile disappeared seemingly forever, but by finding the fossils, we allowed it to rise from the ashes so we could reconstruct it. “Saharica” means “desert,” so the name means “the phoenix from the desert.” We also have found remains of giant plant-eating dinosaurs, crocodile-like predators and many other prehistoric creatures. Being a paleontologist is, for me, about more than just discovering dinosaurs. They are only small pieces in a much bigger picture. Since I was five, I’ve had a deep-seated fascination not only with dinosaurs but with animals of all kinds — with their anatomy and diversity. 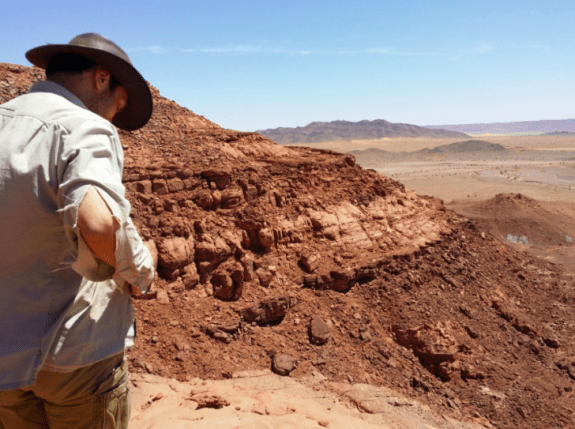 At the same time, my imagination was captured by the idea of traveling to places with exotic, magical names like “Timbuktu” or the “Gobi Desert.” So with paleontology, I get to combine all these passions. What does a day in the life of a dinosaur hunter look like? Well, it’s not a typical workday. We work under very interesting — and often difficult — conditions, mostly in the border region between Morocco and Algeria. When in the field, we go out to the desert with Land Rovers. Early explorers had camels — but that’s pretty much the only difference. We still have to work in scorching heat, with sandstorms and smugglers, bandits and snakes. We’ll stay in the desert for anywhere from a week to over a month, typically in tents. Sometimes there are places in the middle of nowhere where you can get a meal and a place to sleep. But the Sahara is a lawless place. All the norms and infrastructure we take for granted often don’t exist. But it is also a pristine place, in many ways. It’s timeless. Camel caravans follow the same routes they did for hundreds of years. For various geological reasons, fossils in the Moroccan-Algerian border region are often exposed along steep edges, so there’s a lot of climbing on sharp rocks involved. We spend a lot of time walking around, looking for ghosts from deep time: fossils. That’s the best way. You can’t really spot things out of a moving car. What do you look for when you’re walking? We’re looking for bone that’s weathering at the surface, so there’s a chance that there is more underground, where it’s been protected from erosion, rain and so on. We’re talking about hundreds of kilometers, so you really need to develop a pretty good eye. We do have geological maps, so we know roughly where rocks of the right age are cropping up. It’s difficult, though, especially in the Sahara. It’s much easier to look for fossils in Wyoming or Montana, or in famous fossil localities in Canada. There are parts of Canada where dinosaur skeletons are just lying around. Finding things in the Sahara is much, much harder. You’ll find bits and pieces, teeth, enough clues to reconstruct part of the ecosystem. But finding exceptionally well-preserved fossils or partial skeletons is like looking for a needle not in a haystack, but in a desert. Do you get to name your own dinosaurs when you find them? Yeah, it’s a lot of fun. Spinosaurus already had a name, as it had been found about a 100 years ago. The only remains — a few bones, including part of the giant sail, had been in a museum in Munich, and were destroyed during World War II. The scientist who had found the bones in Egypt — German paleontologist Ernst Freiherr Stromer von Reichenbach — was more or less forgotten. My rediscovering Spinosaurus in Morocco was also about restoring his legacy. It was like all the stars aligned so I could close that circle. Being German and Moroccan, I was also probably the only person in the world that could really pull the story off. You’ll have to watch the National Geographic documentary to see why, but it involved a lot of detective work and many crazy coincidences. I actually set out to find Spinosaurus when I was six or seven years old. How could you have known about the Spinosaurus at such a young age? When I finally started my fieldwork in the Sahara, I was in my mid-20s. I had never been there, but I took a group of people to one of the most beautiful — and most dangerous — places in the world. They just had to trust me. An artist’s rendering of spinosaurus and the river ecosystem that existed 100 million years ago in what is now the Sahara Desert. Artwork: Davide Bonadonna, advised by Nizar Ibrahim and Simone Maganuco. So you had this vision of finding Spinosaurus when you were a child — and you achieved that in your 20s. Can you top such a feat? What’s next? I have plans for a couple of projects that could be as interesting, if not more so. But I’m continuing my work in the Sahara, because it’s a big treasure trove. Who knows what we are going to find next? It might be something really cool. Meanwhile, we put together a big international exhibition that will travel around the world for five years. It includes Spinosaurus, all these creatures from the Cretaceous period and the historical background. It was in Washington, D.C., until April. Now it’s going to Milan, then to Berlin. One thing I’d like to do is take the exhibition to Morocco, to make sure we tell this incredible story to the young people of the region. Sadly, many Morrocans don’t know anything about their natural heritage. Morocco’s dinosaurs are pulling in crowds in D.C., and breaking visitor records at the National Geographic Museum — yet in Morocco, some people don’t even know that their country has produced some of the most spectacular dinosaur discoveries. The country is slowly catching up, as are other parts of North Africa and the Middle East. Every culture and country needs explorers, people that are pushing boundaries, and scientists working on topics that are beyond the norm. Of course, this will take resources — a good university infrastructure, for a start, and job prospects. But that early spark of enthusiasm and passion — kids have that. They’re natural-born scientists. Kids are incredibly inquisitive, and for many scientists, like me, the thing that got them hooked was a visit to a natural history museum, a zoo, an aquarium, even a book. It’s important to invest in capturing imaginations. Not every country has plentiful natural resources, but every country has young brains. It’s the world’s biggest asset. This piece is adapted from a longer Q&A that originally ran on blog.ted.com.